From peaked roofs to reclaimed fenestrations, these projects give rise to a new normal for fenestrations and facades. 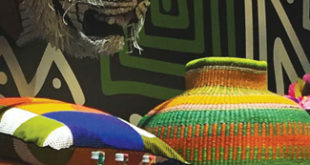 Architecture and design in India has heightened to unimaginable levels. With the rising population, there is also a rise in talent on a large scale. Earlier what could be deemed as the cons of design are now being adopted as pros to create structures which not only add to the glamorous city’s skyline and landscape but also build creative masterpieces that will remain etched in the memory of the city’s integral outline. We have done a dive into a few of these iconic projects in our pursuit at The Inside Track of constantly discovering such gems. The atrocities of living in a financial hub like Mumbai aren’t lost on a local. The population, pollution, humid weather and fast paced lifestyle, to name a few, give the city it’s notorious reputation – A city that never sleeps! For an architect or a designer, the challenges are plentiful when working under selectively frugal circumstances of a busy city. While in Mumbai, despite the informal settings being hard to ignore, the same settings also act as learning modules for those who will embrace it’s ever so cosmopolitan vibe. In a cramped city, where the only way to expand is upwards, the creativity tends to get misplaced. However, there are a few personalities like S+PS Architects that embrace these challenges and build some exceptional design marvels. 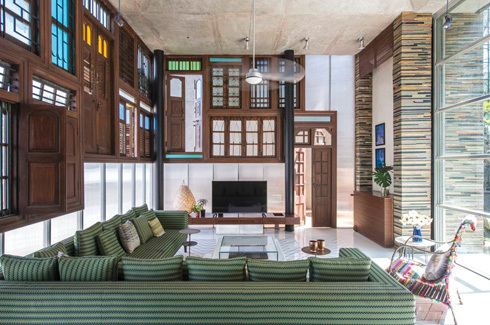 The locally based architects have romanced the ramshackles of Mumbai and designed this one-of-a-kind masterpiece by using recycled mismatched doors and windows, antique wooden columns and metal drainpipes which they found on worn down buildings all over the city. The façade of the building has been designed using these materials in a traditional concept, which also continues into a dialogue in the interiors in this plush residence as these materials have been combined to form a surface that wraps around two sides of the living room. The building’s roof terrace accommodates a lightweight steel and glass pavilion topped with solar panels and decorated with 100-year-old columns removed from a dismantled house. 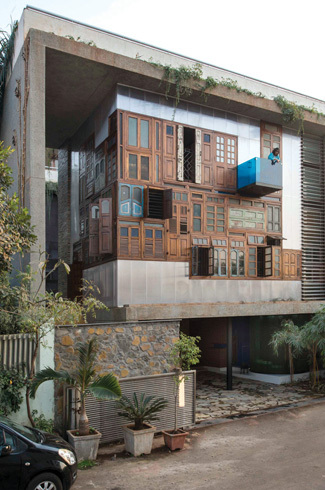 Collage House, named aptly, is located on top of a hill and has been designed using salvaged materials around a central courtyard that gives it the views of the city but at the same time provides privacy from neighboring buildings. This sagacious use of doors and windows introduces a new concept of recycling in architecture and design and a whole novel way of displaying traditional fenestrations. Outlines of structures play a pivotal role in holding the building together – both figuratively as well as practically. Roofs essentially are the external part of the building, in addition to doors and windows that crown and shelter the property. Now, how do we make these functional structures more visually beguiling? 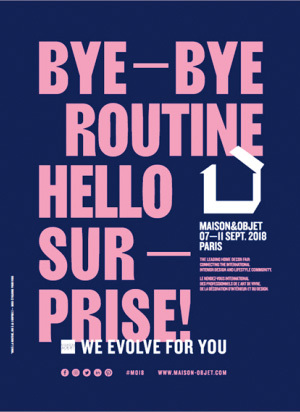 Matra Architects show us how. 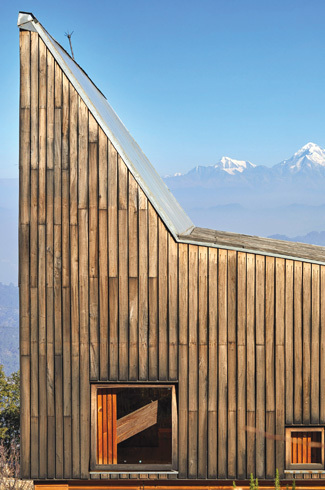 The Woodhouse, designed by them, located in the foothills of the picturesque Himalayas, grabs the attention with it’s peculiar yet striking roof. The form comprises of exposed drystone wall and locally sourced ‘thun’ wooden cladding. 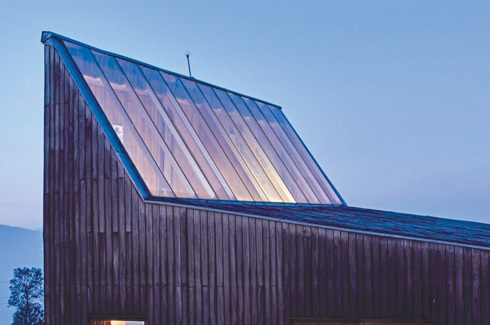 The timber-clad roof mimics its surrounding mountain range by adopting a striking peaked profile that also has a large skylight integrated on to it’s slope to maximize the natural light coming in. The structure comprises of four 14.5 frames made of Salwood and shaped by several thin steel tie rods and glued planks which completely supports the entire roof and envelopes the entire building including the mezzanine. These truss frames behave as the main structural element suspending the entire structure to create an unhindered column free space. The interior is arranged over three distinct levels and has a glazed slot running along the top of a stone plinth that extends around the base of the house which further creates a sense of being in touch with the surrounding terrain. 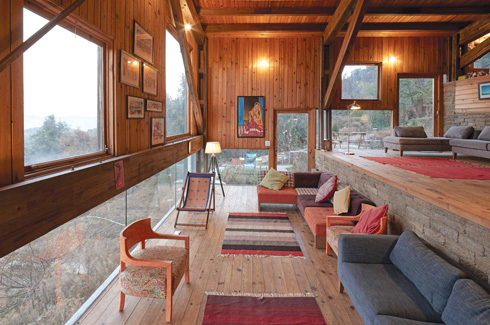 To continue that dialogue with the natural surroundings, all wooden walls are perforated with square shaped windows that act as picture windows perfectly capturing the views of the snow clad northern Himalayan panorama from all the rooms of the house. Boasting of five bedrooms and five and a half baths, this peaked roof holiday home is the ultimate example of the finesse and importance a roofing structure can add to a building. In a nut-shell, the Woodhouse is a classic example of the merge of vernacular architecture with sprinkles of modern structural elements and an exceptional building profile. Railings have always been the duller companion of windows and facades. More functional than aesthetic, they have been used for the purposes of security, safety, privacy and structural support. Not wanting to be left far behind, more and more railing structures are being created with trying to be aesthetically sleek in addition to the functionalities they are meant to incorporate. The rooftop bar perched atop the glamorous Four Seasons hotel in Mumbai, have achieved this rare railing design. 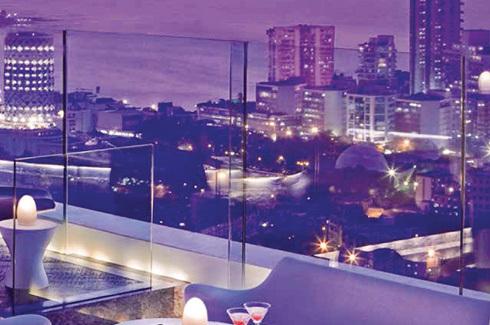 Attracting tourists as well as locals in equal measures, it is the highest rooftop bar with spectacular views of the Mumbai’s glittery skyline. In addition to the visual appeal of it’s clarity and sleekness, it creates an even more important function – ventilation! Since it is situated on the highest level and gets extremely busy on the weekends and pretty much every day during the winter, safety was of utmost necessity when designing it. Keeping in tone with the upscale and minimalistic furnishings, the railing had to be in tone with the setting. The designer’s choice of safety-glazing in the balustrade was on point. At the edge of the premises, it creates an almost invisible protection between the guests and the city views. This highly transparent ‘wall’ is made of laminated safety glass, has a frameless design and is strong enough to carry the wind impact loads. The panels each measure 1.7 meters x 2.3 meters and consist of two 12mm glass panels laminated together using a 3mm interlayer SentryGlas®. The railing was installed by Permasteelisa – a prolific specialist in architectural glazing. Another advantage of this glass balustrade laminate is it’s higher stiffness and toughness compared with traditional safety interlayers. Even if a glass panel gets broken, the interlayer helps keep the self-supported panel in place until it can be replaced. Traditional interlayers are flimsy and can cause a glass balustrade to fall over after breaking, which can create a dangerous gap in rooftop protection and a possible hazard below. In addition to the visual appeal of it’s clarity and sleekness, it creates an even more important function – ventilation! The glass panels are placed parallel to each other, slightly overlapping but leaving a small gap in between every piece to facilitate cool breeze at all times of the day throughout the year. Playing an integral role in naming the place ‘aer’, these airy railings are not only a welcome feature in the city’s formidable humid climate, but also the focal point of the dig. Previous What’s On Your Wall?